In November, Shari from The Misty Mom was my featured blogger. You can read that post and see other past featured blogs under the "blog of the month" label! Being my blog of the month gets you a designated blog post, a sidebar button, and a mention on my Twitter account. The sidebar button stays up all month long. I don't believe in necessarily making bloggers pay for advertising and I'd much rather show you blogs that I really enjoy reading. And I hope you end up enjoying them too! For the final blog of the month for 2017, I've chosen Alanna from Classy on the Run. I met her in person a few years ago at one of our network's dinners. It's been a while since I've taken part in any of the events with my knee, but I hope we have another one in 2018 sometime so I can finally attend again! Alanna is incredibly sweet and I feel confident in saying that she has the prettiest hair of anyone I have ever met. 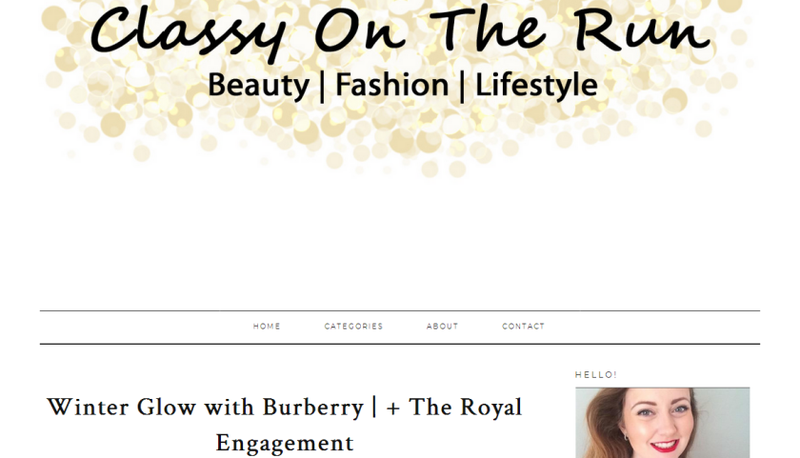 Her blog is mostly beauty and lifestyle with reviews and swatches. If you check out her blog, let her know I sent you!